Mental illness is very common. One in five (20%) Australians aged 16-85 experience a mental illness in any year. The most common mental illnesses are depressive, anxiety and substance use disorder. These three types of mental illnesses often occur in combination. Australian Rotary Health is one of the largest independent funders of mental health research within Australia. 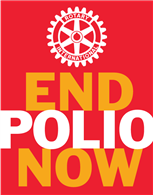 Australian Rotary Health have a number of different events that will engage with your members and potential members. 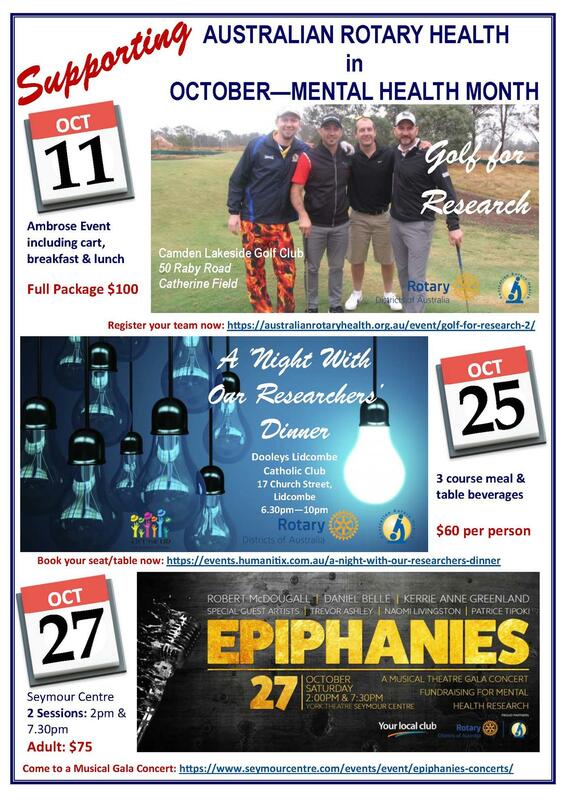 Thursday,11th October, 2018 – Golf for Research – Camden Lakeside Golf Club, 50 Raby Road, Catherine Field. This will be an Ambrose Event (team of 4) with players sharing carts. The Full Package includes Breakfast and Buffet Lunch. 7am - Registration starts and 8am - Shot Gun Start Presentation and Lunch at 1.30pm. Professor Jane Pirkis - Jane has undertaken a number of policy-relevant studies of suicide and suicide prevention in Australia. She has a particular research interest in suicide and the media. Professor Vera Morgan – Vera is a psychiatric epidemiologist with a special interest in studying schizophrenia and other psychotic disorders using record-linkage and survey methods. Professor Allison Waters -Allison focuses her research on the cognitive-neuroscience of emotional disorders in children and aims to translate findings from laboratory and basic science research into clinical practice. Saturday, 27th October, 2018 – Epiphanies, A Musical Theatre Gala Concert – York Theatre, Seymour Centre. Epiphanies will present some of the greatest pieces of music from the great shows of the 20th and 21st Centuries, backed by a stunning 18 piece orchestra. Rob McDougall (Les Miserables), Kerrie Anne Greenland (Helpmann Awarded Eponine, Les Miserables; Violet, Sideshow) and Daniel Belle (The Ten Tenors; Cover Valjean, Les Miserables) perform a dazzling array of pieces from the most beloved musicals, including Phantom of the Opera, Carousel, Wicked, The Secret Garden, Sweeney Todd, Sunset Boulevard and The Sound Of Music.